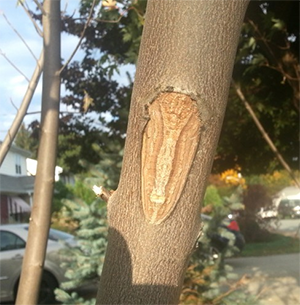 Reginald Sanders and his fiancee were having a conversation about spirituality, of all things, when they glanced at a nearby tree and noticed something they’d never seen before – an image they both thought looked like the Virgin Mary. 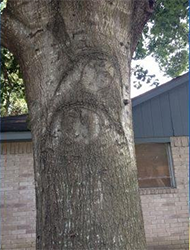 The tree, which is on the 11700 block of Sawmill Stream Circle, Houston, Texas, has become something of a local curiosity, with people stopping by and praying at the tree. Sanders says he hopes everyone who looks at it is blessed. So far they are since it’s still free to look. 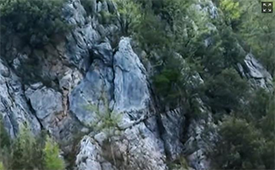 Last summer, after a chunk of rock broke off the cliff during a small landslide, visitors to the small town of Casaletto Spartano, Italy, noticed something the locals hadn’t – an image in the rocks they thought looked like the Virgin Mary. Since then hundreds of visitors have shown up to check out the “Madonna of the Rock” according to La Citta di Salerno website. Strangely, the rock happens to sit just below a path used by local people during religious processions. “We don’t know what it is,” a villager told the Italia 2 news channel, “but the more you look at it the more it looks like a real Madonna,” including hands and a cloak hanging down. 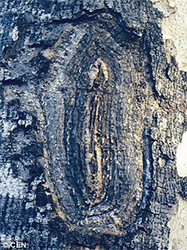 Seventy-five-year-old Dona Lidia, of Pocboc, Mexico, was on her way to work as a cleaner at the local high school when she spotted something in the trunk of a Melina tree that looked like the silhouette of the Virgin Mary. “I have been working here for 18 years and always take this route and I can assure you that the image was not there before,” she said. “‘I instantly had to tell my neighbors and when they came the word quickly spread.” Spread it did. Dozens of candles and flowers are left each day as an offering, despite some killjoys who say it’s just tree rings. A group of residents held a festival around the tree today (December 12) and plan on asking the region’s bishop if the image could be considered as an official miracle. Madre mia! 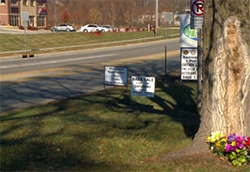 At a busy intersection on 3rd Street Bridge Road in Polk City, Iowa, an image has appeared on the trunk of a tree. A six-foot tall image that people think looks like the Virgin Mary, though some think it looks more like Jesus. Others think it’s Mary holding the baby Jesus. Whatever it is, people have been flocking there to see it. No one seems to know how it got there, just when it appeared, or even whose land it stands on. Mysteries abound. Chef Jermarcus Brady was slicing eggplants at Gino’s Restaurant in Baton Rouge on Monday when, as he puts it, “I saw a miraculous image formed by the seeds. 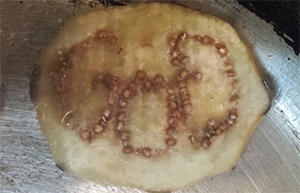 It spelled out the word ‘God’!” The restaurant’s co-owner, Gino Marino, who has been in business for nearly 50 years, said, “You could cut one million eggplants and you’d probably never see that again, it’s that rare.” Maybe even rarer. Brady and his coworkers took photos to preserve the memory. No word on whether they’ve tried to preserve the slice of eggplant or whether it was salted and sauteed along with the rest.